With its gentle bow shape, this lustrous 9ct white gold band, almost creates a heart shape. A perfect symbol of your love. Especially as it's set off beautifully with sparkling diamonds. 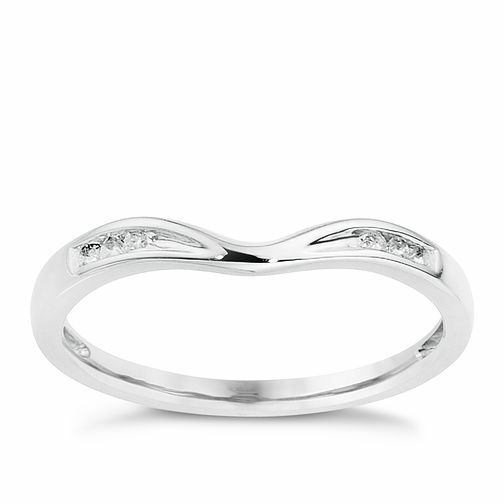 9ct White Gold Diamond Shaped Band is rated 5.0 out of 5 by 10. Rated 5 out of 5 by Anonymous from Perfect fit The ring is lovely and perfectly fits with my engagement ring which requires a shaped bow band due to its shape. Rated 5 out of 5 by Anonymous from Lovely ring This sits perfectly with 9ct White Gold Illusion Set Diamond Solitaire Ring. Used it as ny wedding ring. Been married 4 years and unfortunately lost it, but replaced it with the same ring as it’s such a nice ring.